The basics components of any Internet of Things application powered by Ubidots are: Devices, Variables, Synthetic Variables Engine, Dashboards, and Events. Within this article we will address each of these concepts as they relate to Ubidots IoT Development and Deployment Platform and how you can better organize your Ubidots Apps to best connect with the users. Once your devices, variables, and general Application is assembled, give your App some layers with Ubidots Device Management to learn more about Ubidots internal architecture and how you can use Apps, Organizations, and Users to efficiently connect your data with those who should be using it. A Ubidots' device is a virtual representation of a data-source or simply, an asset taking sensor data and transmitting said data through a connection protocol to Ubidots' cloud. 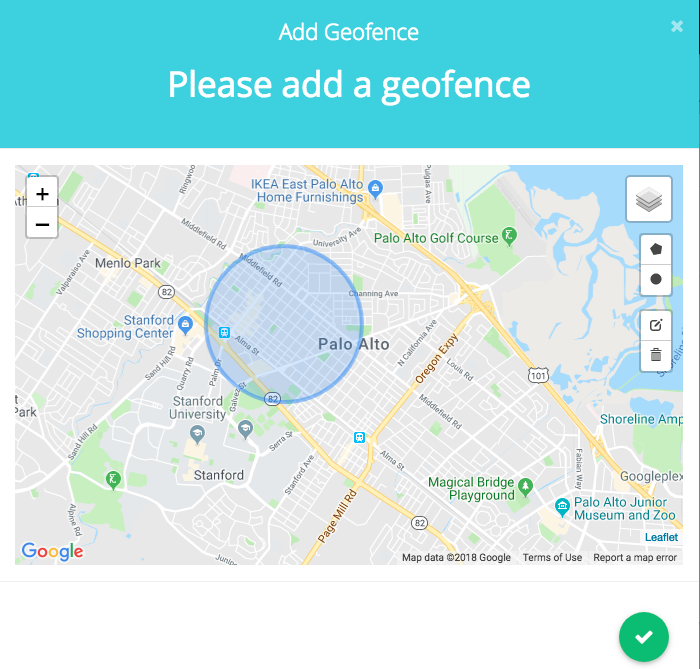 Click here for current firmware examples and tutorials for connecting your device to Ubidots. Filling parameters for authentication and connection such as a TOKEN (i.e. the unique ID for each account or user), device and variable labels (i.e. devices and variables unique identifiers in Ubidots), Wi-Fi SSID and Password, depending on the device and the requirements. Making API request (i.e. a call from a device to the web server). Ubidots’ libraries spare the need to manually make these requests. However, if you’re working with a device not currently in the list of supported hardware, you can choose a connectivity protocol such as MQTT or HTTP and make a request using the API accordingly. Devices are created automatically in Ubidots the first time a dot is received to a user's private TOKEN or an Organizational TOKEN. Clicking the "+" icon in the top right corner of any single device's screen. Once a device is created and receiving data from your hardware or another 3rd party data-source, the data will be presented in its raw or calculated form as a variable. – Default - raw data coming from devices (people counted). – Synthetic - correspond to statistical or arithmetical operations of default variables in a determined time-frame (e.g. average daily traffic this month). Below you can read more about synthetic variable setups. Creating variables: there are two ways to create variables. Assigning a label as a variable within your hardware's code. Clicking the "+" icon found in any single device screen and assign a name which will also correspond to the variable's label. By default, Ubidots assigns an additional unique identifier to the variable called Variable ID. To find both the variable's ID and variable's label, select the "i" icon form the variables card. Ubidots Synthetic Variables (SV) Engine is a simple and effective way to create insights from the raw data stored in Ubidots' Cloud. Using Ubidots SV Engine, users can create Synthetic Variables that calculate and enhance data to give data-driven decision to user of an Ubidots powered application. 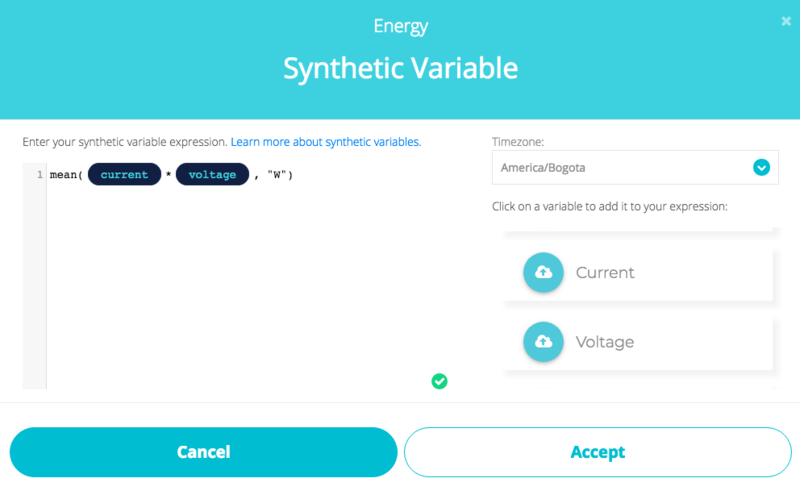 For example, to calculate Average (mean) Energy consumed this week, we will need to create a synthetic variable called Energy to calculate the product of Current and Voltage (P=C*V): the default variable Current is multiplied by Voltage. Then average the product every week with built-in function mean(). Here is a complete list of available functions, such as cos(x) or ceil(x) functions, and more! Note that default variables are yellow, and Synthetic Variables are green. Dashboards are the human-machine interfaces where data is easily visualized. Your Ubidots account will let you create as many dashboards as needed, containing widgets and data-visualizations to comprehend your data at a glance. For additional details on your dashboard's construction, check out this tutorial. In Ubidots, Events are messages triggered and delivered through Email, SMS, Telegrams, Slack, Voice Call or webhook messages based on a customized design rule created in the application. If you wish to create alerts for your IoT application, check out this tutorial for additional support. You can also determine the format of alerts by choosing between emails, SMS, Telegrams or Webhook.